Original unfolded 22"x28" US Half Sheet film poster from 1967 Starring Paul Newman Directed by Stuart Rosenberg. Half sheet posters are much more difficult to find than one-sheets, and are on thicker paper/card This is original promotional material as used to promote the movie at the time of release. I DO NOT sell reprints/repros/fakes. CONDITION & DESCRIPTION: EX overall...... A few hairline surface creases at the "W" and "M" of "NEWMAN" at top. 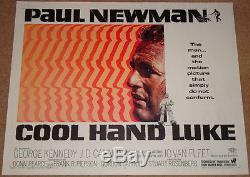 The item "COOL HAND LUKE Original 1967 US 22x28 Half Sheet film poster Paul Newman" is in sale since Tuesday, April 16, 2013. This item is in the category "DVDs, Films & TV\Film Memorabilia\Posters\Originals - US One Sheets\Pre-1970". The seller is "jcullen1" and is located in Scotland. This item can be shipped worldwide.